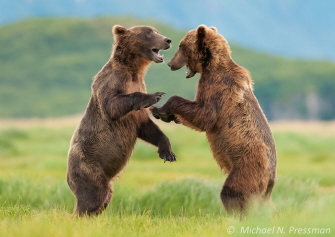 Capturing "The" moment as opposed to "a" moment is one of the things that drives New York-based wildlife photographer, Michael Pressman. 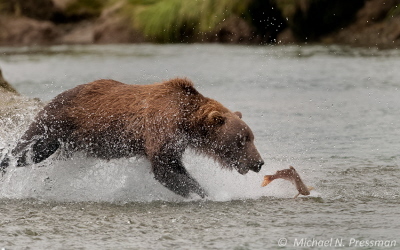 This is obvious in all of these photographs of Brown Bears which he took in August on a trip to Katmai National Park in Alaska. 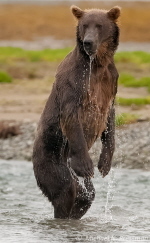 Pressman was staying at the Katmai Wilderness Lodge which is the only lodge on the pristine North Pacific Coastline of Katmai National Park. 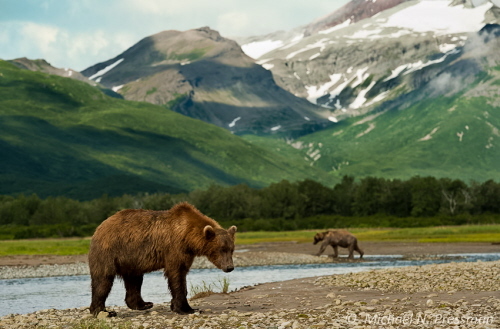 In this unadulterated wilderness, there are more than 2,000 brown bears, also known as coastal brown bears (same species as the inland grizzlies). These bears can weigh as much as 900 pounds and stand as tall as 9 feet. 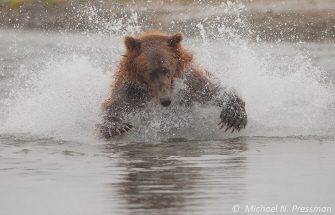 With experienced guides from the lodge, Pressman was able to not only observe their behavior in the wild, but capture some of the most compelling images imaginable. Here he clues us in on how he goes about getting such shots. Get down and dirty if you have to. For many shots, it's important to get down low, even lie in the mud. That's how you can separate the tourists from the professional photographers. Tourists often stand while taking photographs. 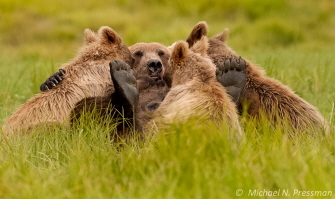 This image shows a mother bear nursing her three cubs. Don't be stingy with your finger on the shutter. Get the biggest card you can afford and shoot a lot. Gone are the days when you had 24 or 36 exposures in a roll of film and every click mattered. Also, always shoot RAW. If you shoot JPEG, you have limited editing options. When Pressman photographed this family, in most of the shots in the sequence, they were NOT all looking in the same direction. Fortunately, they were in this one. Be patient and wait for something to happen. 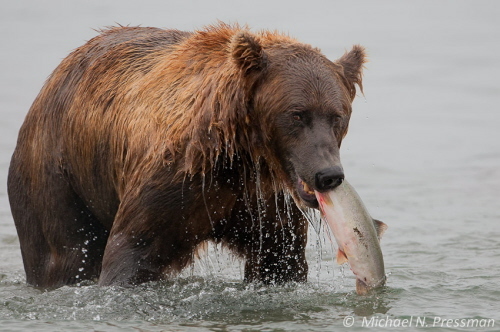 So much of photographing wildlife has to do with observing and reading the behavior of animals. When something happens, you have to be there. Know the burst limitations of your camera. What a catch! Pressman was able to capture this moment by shooting burst (continuous shooting mode). But it's important to know your camera's burst limitations. You can be rattling off shots but miss "the" moment because the camera's buffer is full. With that in mind, it's important to monitor your resources. Pressman recommends shooting in bursts of 5 or 6. Understand that getting good photos has to do with skill, but also luck. 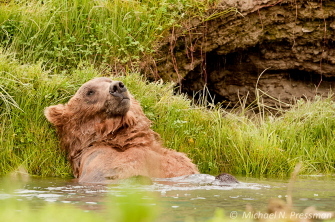 This guy was taking a short break to cool off and Pressman spotted him from across the stream. Pressman was shooting with a long lens (500mm), which means he was generally keeping a safe distance. But every now and then, bears did come within 5 or 10 feet of him. While humans are not a food source for these bears, it is important to stay calm, pay attention and if necessary, stop shooting. Unless background is integral to the photo, make only your subject sharp. 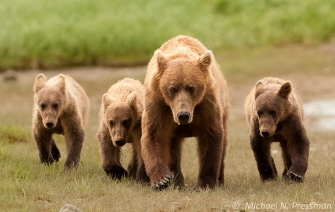 In wildlife shots, you want to lead the eye to the subject, not anything else. Get the broader views as well. While it's tempting to snap away getting close-up shots, step back and take the time to capture the whole scene. And, of course, always be aware of composition. After a thirty-year career in national broadcast journalism, working for both ABC and NBC news (on programs such as 20/20, Dateline NBC, and the Today Show), Pressman recently returned to his first love in visual arts--still photography. This love affair began when he got a Brownie camera at the age of seven. From there he moved on to a 4 x 5 Graphlex, a Rolleiflex twin-lens reflex, and then, his first SLR, all hand-me-downs from his father. Soon, in the family darkroom, he was developing film and making prints for his Brooklyn neighbors (for 3 cents a print). Throughout the coming decades, while he was a NYC teacher and then through his long TV career, he never stopped taking pictures, but there was little time for photography. Not anymore. Recently, Michael has exhibited his work in the NYC metropolitan area at the Rockefeller State Park Preserve, the Greenburgh Public Library, and the Harriet Ross Gallery and Studio.